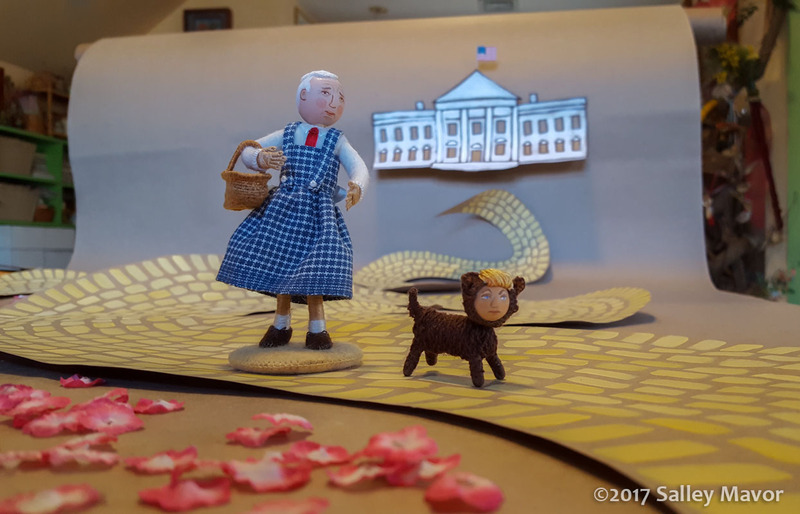 To commemorate the upcoming inauguration, the Wee Folk Players (They’re a Stitch) decided to film a production of Mr. Pence Goes to Washington. There’s nothing like a deadline to get you going and moving they did, albeit one millimeter at a time, with hundreds of camera clicks. 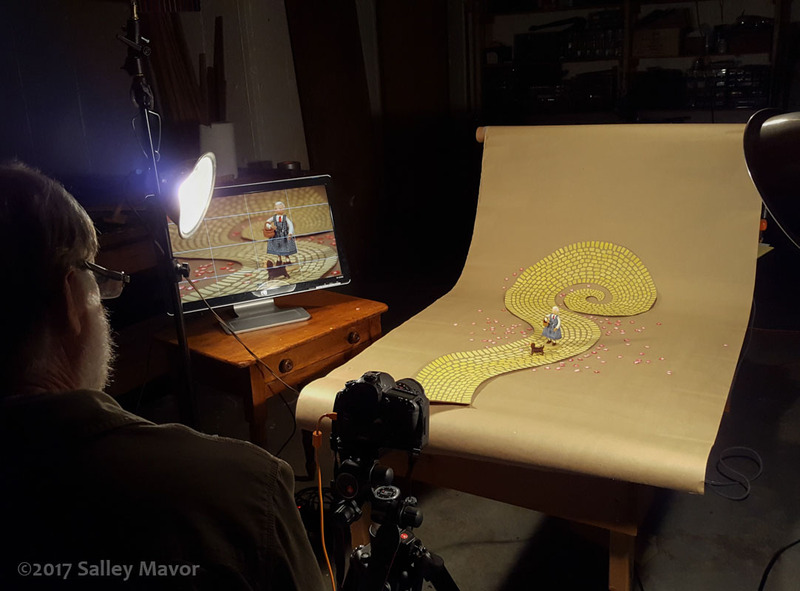 The stop-motion animation process demanded great patience on the part of the actors, as well as the director and photographer from Dubious Productions. Just like in Hollywood, it took a lot of standing around between scenes and discussions about the simplest actions. Everyone hung out together in the basement for several full days, determined to get through as many shots as it took to make a 1 minute video. The troupe came out unscathed, but there was a question as to whether the dog’s tail would stay attached, after wagging so hard! 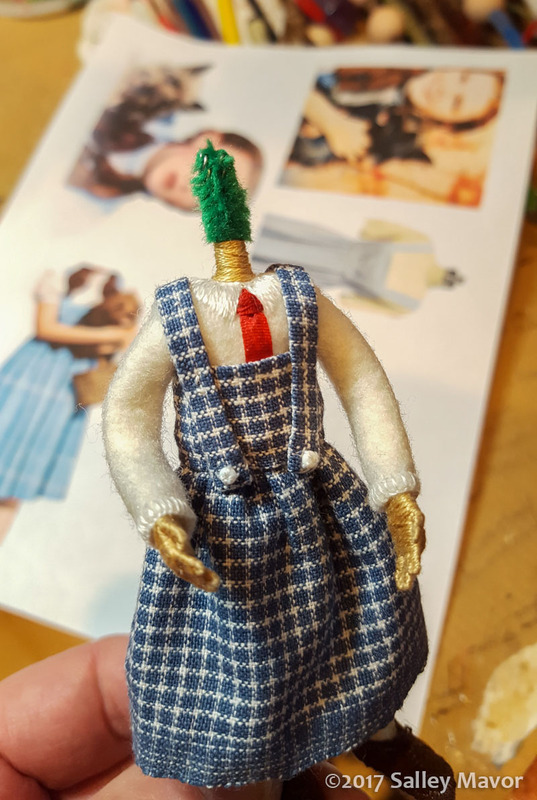 The cast member playing Mr. Pence wasn’t so sure that his assigned costume would give the right impression, but once he tried on the gingham frock, he felt right at home in the role. 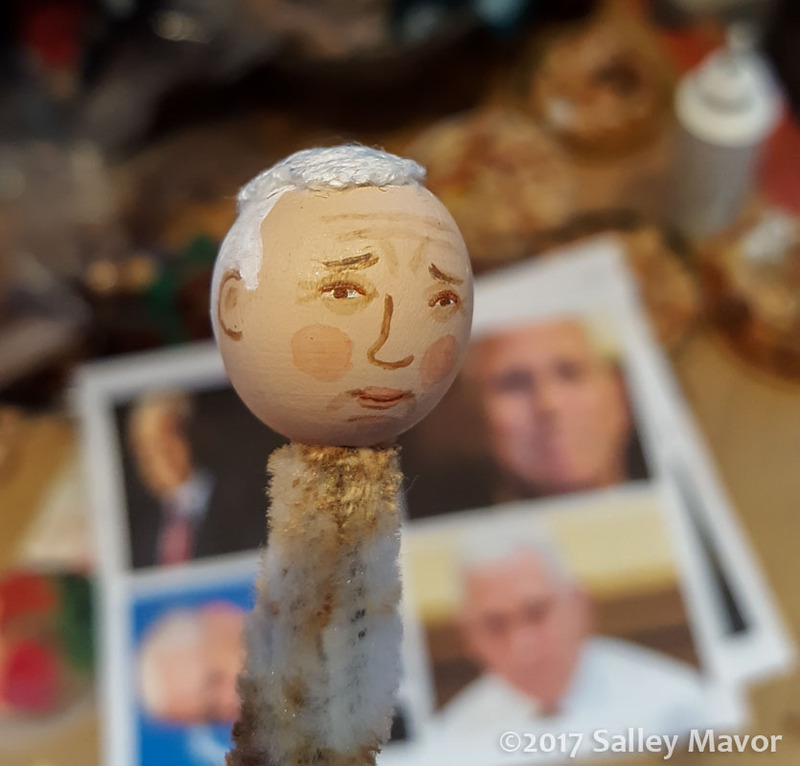 Makeup for the Mr. Pence character was a challenge, but white cropped hair and a permanent look of disapproval on his otherwise bland face helped bring him to life. As for the little guy, his head had to swivel around and his tail needed to wag. This costume fitting got a little out of hand. Don’t theater people say that animals and children always steal the show? 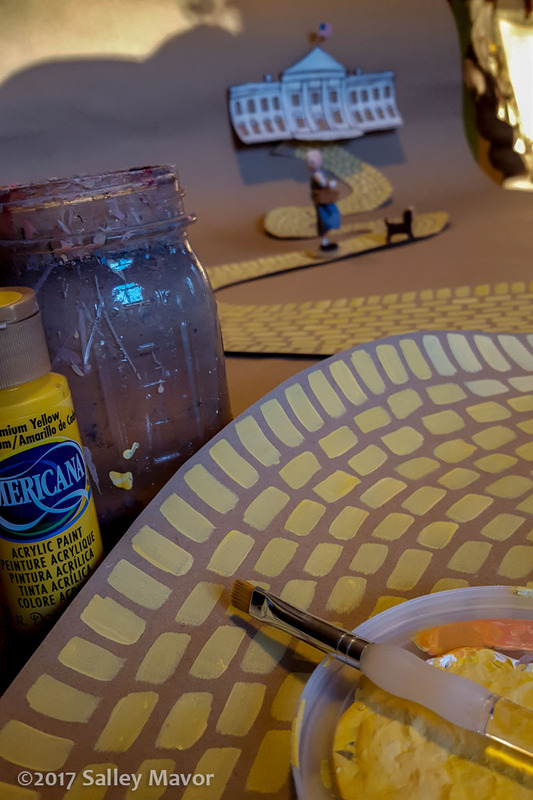 The set department painted a gazillion yellow bricks for the road. All in all, the cast enjoyed their moving performance and are already rehearsing for the next chapter in the American Drama Series. 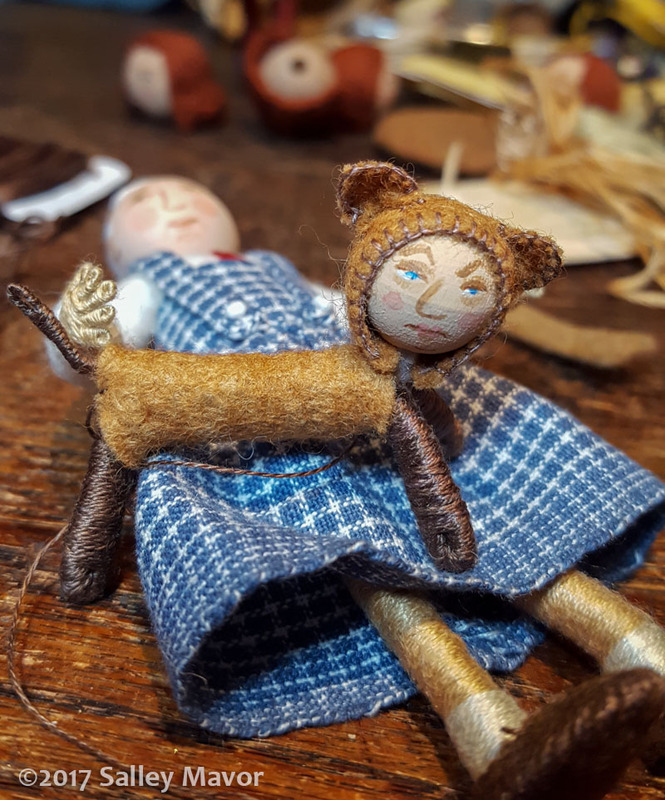 This entry was posted in American Art - post-election period, Video, Wee Folk Players (they're a stitch) by Salley Mavor. Bookmark the permalink. Many of us here in Indiana have long promoted the slogan ‘Pence Must Go’. In hindsight I wish we had been a little more specific. Washington was not what we had in mind. Teehee, you made me laugh Janet. OMG this is the best thing yet! Sorry to throw cold water on the “fun” but please try to imagine if someone had depicted Obama as a dog when he was about to be sworn in, can you imagine the screams of protest and the accusations of racism, etc.? I did not vote for Trump but I am disgusted with the behavior of some others who also did not. Obama has always acted with dignity, truth, and elegance. The same can never be said for the president-elect. Political satire is definitely in order. Oh my gosh! Choked on my tea! 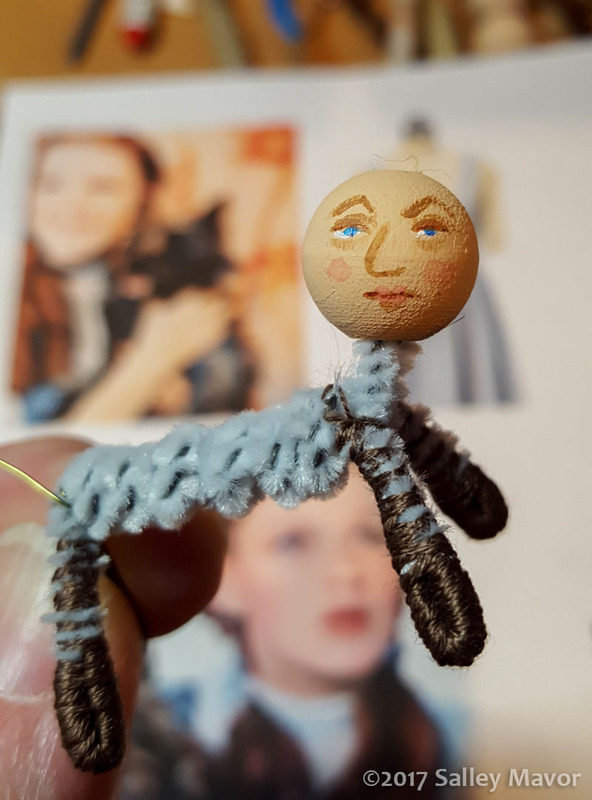 Thank you so much, on so many levels, for doing this. Um. This is in very good taste. Political Satire has been part of the political scene for a very long time. We need this form of expression and quite frankly it’s much more civilized and “fun” than much of what was leveled and still is being leveled at the Obama’s. Keep up the great work Salley. I will not stand behind a president who is racist and sexist. I could stand behind another party’s president if they were truly a civilized human being. Oh dear, I am sorry to see the changes here…our VP dressed as a girl ( I know, supposed to allude to Dorothy, etc.) and the continuation of such vitriol. I did not vote for this team but it is time to move on and unite as Americans and stop being so negative. Fostering the hate doesn’t seem very productive …or creative…to me. My political satire will not be appreciated by all, but I believe that the future of our democracy depends on speaking out and exposing the tragedy of what is unfolding before us. I am so very tired of being told it’s time to move on and unite! It is NOT time to move on and I can’t see that it will ever be time to unite behind this embarrassing administration. If you really can’t hack the satire here, you don’t have to keep looking. You have a choice. I am going to run out of superlatives before this is over. Your are an amazing artist and this must have been so much work. Fabulous production! Thank you for humor and insight and sharing. And as always, your workmanship is superb! No, we will not be “uniting and moving on as Americans”. What’s unfolding right now in our country is unprecedented and terrifying and thinking citizens must be vigilant. Thank you for speaking out with your unique voice, Salley. I couldn’t agree more. It’s time to speak up and make our voices heard. YOU are a genius! Who knew you had this political satire in you! Love the video. Love the whole concept! Keep ’em coming! You help us keep our sanity! This just blew me away – didn’t see it coming at all! Your artistic satire definitely brings a much needed smile to my face as we head into what is shaping up to be a very bleak time for America – please keep ’em coming! Love your rapier wit. So necessary in these sad times. I found your blog through Kristin Nicholas and am now a follower. Never stop. Bravo Sally! Your satire brings some “humor” to an otherwise sad time for American democracy-don’t stop! Well done, Salley! Since our new president-elect will have no Moral Agenda, it is up to us. I really, really appreciate what you are doing with your art/passion/life. Keep on keeping on! Fantastic! Can’t wait to see the video….! Excuse my musical ignorance but is that epic music by chance Russian? If so it adds to the hilarity. Keep up the amazing work. Thanks Cynthia, it’s the New World Symphony by Antonin Dvorak, who was Czech. I am baffled by the people who are offended by your satire, Salley. I have been very deeply offended every day by Trump’s words, spoken and written. There is nothing you can create that would outdo his offensiveness. His offensive behavior is blunt and ugly; your satire is sly, witty, and spot on. I’m very excited by your work. Thanks for taking the time to do it. 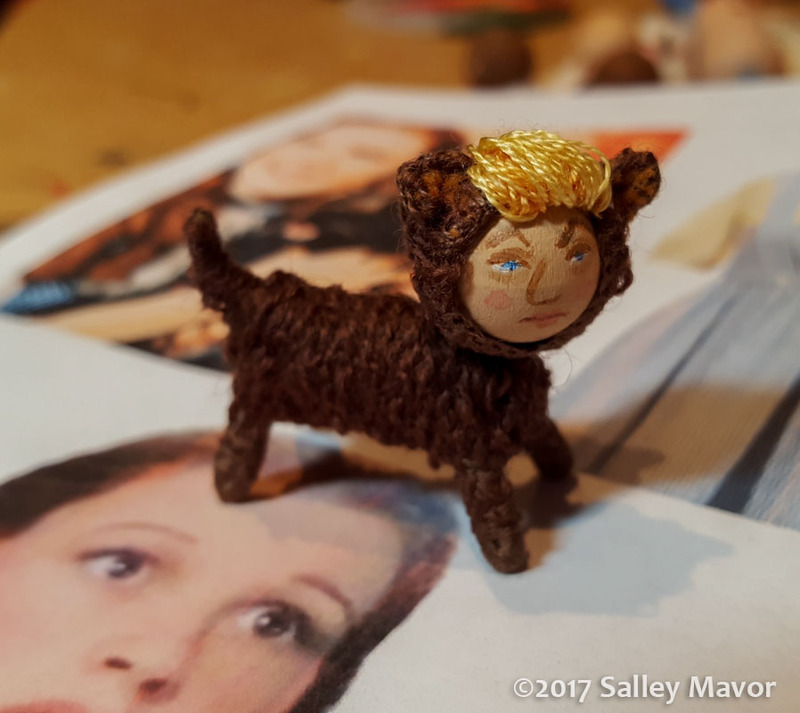 Dear Sally – I truly believe that as we enter such a period of uncertainty that artists and creatives will play such an important role in provoking thought and accountablity. Thank you so much for your bravery in allowing your work to serve this purpose. Your supporters are here, keeping those trolls at bay! I am grinning. YOU. ARE. WONDERFUL. Hmmm, I’m waiting for the appearance of some other characters. The flying monkeys, for example. And of course, Elphaba herself. Love it – tho perhaps a little unfair to Toto!!! Beginning with the primary season, I found it very difficult to laugh at the various comics who reflected on the absurdity of the tRump campaign. Once the final counts came in on election night, I allowed myself to sniffle for a bit as I anticipated saying farewell to a sane, intelligent leader while bracing for the tRump regime. You helped me find hope that my sense of humor might survive this madness. Thank you for that and for having the courage to “go there”. Unite behind a narcissistic bully??? In our public schools, we teach our students to do the exact opposite! We encourage them to speak up. Thank you, Salley, for adding your voice. Keep on going Salley! Political satire is HEALTHY!! We need it! !I LOVE that you are doing this Salley. We appreciate the time and effort it must have cost you to produce this 1 minute video. THANK YOU!! YAY for Public satire, Public debate. Love it. Absolutely fabulous! Thank you. I had a lot of fun watching the video! Political Satire has been around for a long time and should not go away because some people find it offensive….I find President elect Donald Trump and VPE Mike Pence very offensive! Can I make them go away even though they did NOT win the popular vote? NO I can’t! Beside there is a little thing called freedom of speech–Let’s hope we keep that! 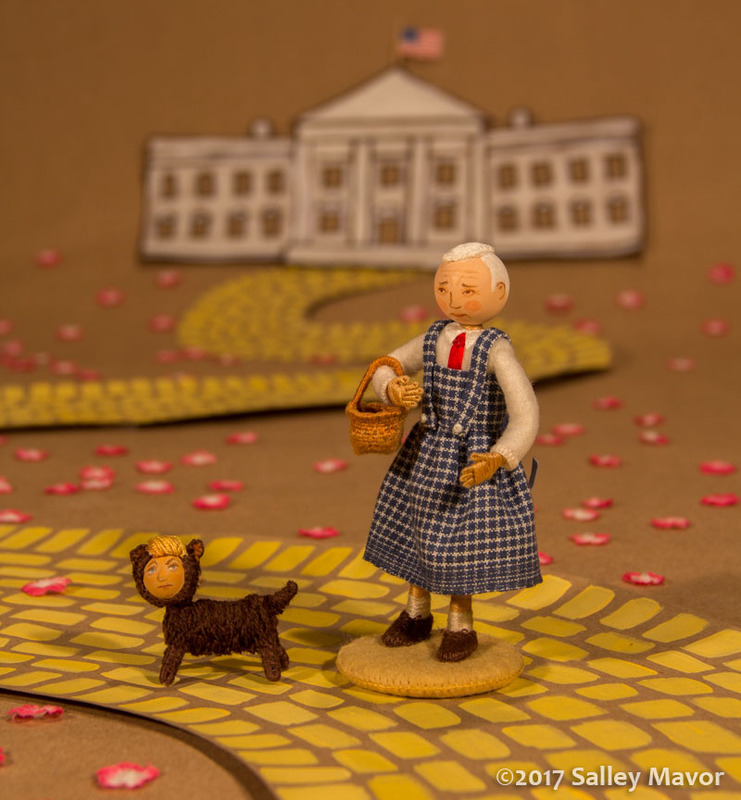 So hubby and I were trying to figure this one out why Pence was Dorothy and Trump is Toto and what you were trying to convey.. So Trump, like Toto is very yappy..and is always running around barking (tweeting) at everything.. Dorothy is focused, (on one goal, to get to Emerald City so she can return home). She is also very protective of Toto. You got it Rebecca. Thanks for explaining everything so well! Thank you Salley, and Rebecca for explaining. I love watching this unfold. On the edge of my seat to see Act II! Love this. Political satire is especially good “ammunition” as Trump has absolutely no sense of humor. Thank you! Thanks! I needed that! It’s wonderful. Great. Keep them coming. You are giving us the courage to find our voices.